Statue of Commerce and Industry. Angel Building, Paisley Road West, Glasgow. The Angel Building was built in 1889, as Ogg Brothers Drapery Warehouse, and is a much loved landmark in this south side district due to the angel which surmounts its south turret. The identity of the angel and its sculptor have long been forgotten and, consequently, have been the topics of much debate by locals and historians alike. In 2000, the nearby Angel Bar held a competition to find the most humorous name for the statue, whilst sculpture historians Gary Nisbet and Ray McKenzie at Glasgow School of Art agreed that James Alexander Ewing was the likely sculptor. 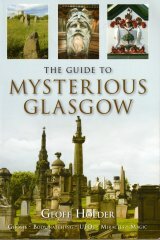 However, in 2004, Gary Nisbet, the author of the glasgowsculpture.com website, discovered the true identity of the statue, Commerce and Industry, buried in a lengthy account of the building's opening in an article published in the Govan Press newspaper, on 21st September 1889. Unfortunately, the article does not confirm the identity of the sculptor. Although the discovery of the angel's 'official' name, Commerce and Industry, came too late to win the Angel Bar's prize of a bottle of whisky, it is to be hoped that if this rather mundane name doesn't catch on with the locals, they could always refer to her simply as Mrs Ogg, just as the statue of Learning on the Mitchell Library is known as Mrs Mitchell.